The Moving Water Oil Boom is a marine grade containment barrier designed for extended use in rivers, lakes, streams, ponds and other flowing areas. Manufactured with hydrocarbon and water resistant fabrics, these boom feature a PVC fabric and marine grade connectors that helps control the flow of oil and prevent spreading while cleanup efforts are underway. All moving water boom are designed to handle some currents, waves and tides in your location. Typical Draft: 6", 12", 16"
Moving Water Oil Containment boom are a frequent choice for areas dealing with any kind of current or waves. When compared to the calm water boom, moving water barriers feature tension cables that help to maintain control against moving conditions. With standard section sizes of 25, 50 or 100 feet, these boom sections can easily connect together to form lengths of hundreds or even thousands of feet. Tension Cable 5/16" Tension Cable 5/16"
Bottom Ballast 5/16" Bottom Ballast 5/16"
Marine accessories are often required for any location using boom or barriers in a moving water area. This will include locations with currents, tides, waves, or high wind areas. As a manufacturer of flexible containment products, we are often able to manufacture boom to site specific requirements and specifications. If you do require specific components, parts, fabrics, or lengths, please do not hesitate to contact us! We are always happy to work with customers to find the right product for your location. 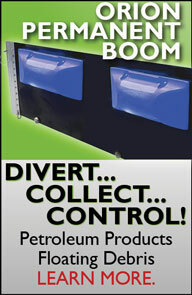 Additional boom models include Calm Water boom and Open Water Oil boom.